Unrest among South African miners has spread to the world’s fourth biggest gold mine. Bullion miner Gold Fields said about a quarter of its 46,000 workers have walked out in the first strike to affect South Africa‘s gold mining industry since violent protest shut down London-listed Lonmin’s platinum mine nearby three weeks ago. Gold Fields, which is listed in Johannesburg, said 12,000 miners have been on a “unlawful and unprotected” strike at the KDC mine near Johannesburg since Wednesday. The KDC mine produced 1.1m troy ounces of gold in the year ending December 2011. Gold Fields’ shares closed down 2.8%. 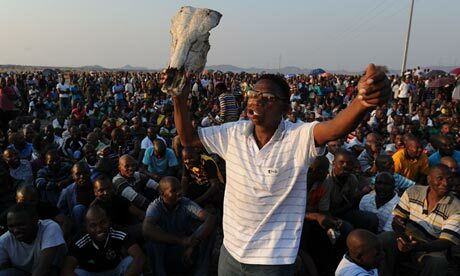 At Lonmin’s Marikana mine, just 5.7% of miners turned up for work on Friday, a day after South African prosecutors said they were charging 270 miners arrested during the so-called “Marikana massacre” with the murder of their 34 colleagues who were shot dead by police. The murder charge â€“ and associated charges for the attempted murder of 78 miners injured at the Marikana mine near Johannesburg â€“ was brought under an obscure Roman-Dutch common law previously used by the apartheid government. South Africa‘s justice minister rebuked prosecutors for the move, saying the decision had caused “shock, panic and confusion” among the general public. Mines minister Susan Shabangu acknowledged this week that the recent labour violence would impact potential investment into South Africa.